As you probably know, my brother, Eric, lived a very active life prior to the tragic accident last year. Eric was a firefighter for the city of Fresno and has three precious children with his wife Molly. Eric suffered a life-changing spinal cord injury and is now a C6-C7 incomplete quadriplegic with the inability to walk. After he spent 3 months fighting for his life at a Level 1 trauma center in Fresno, 1 month in a spinal cord rehabilitation program in Santa Clara, is now he is wheelchair bound living at home. Eric recently had to take medical retirement from the Fire Department, his dream job that he was incredibly passionate about. In spite of the many struggles he faces, Eric remains hopeful that he will be able to return to a productive life in the community through the support of family and friends. Eric is hoping to attend an out-patient therapy program that will help him regain strength and learn to navigate life in his new body. Fees for specialized rehabilitation therapy are not covered by insurance and the costs surrounding these programs can be prohibitive. Hello fellow “Eric supporters”…we’ve started planning for the 7th Annual Eric Keeslar Golf tournament, so…. Mark your calendars and plan to join us for the 7th Annual Eric Keeslar Golf Tournament. For those of you who don’t know, Eric was involved in a Motor Vehicle Accident in September, 2012 and he is now a quadriplegic. Damon and Destiny Norvell have graciously hosted this tournament starting with the 1st Annual when Eric was still in the hospital, and the money raised has made an incredible difference in his life!! All of the proceeds from this fundraising event go directly to support Spinal Cord Injury-related therapy and equipment for Eric. So, whether you are a golfer or just want to join us for the BBQ dinner, please come have some FUN, and fight for a great cause!!! Many blessings for a wonderful holiday season!! Attention all Golfers and Non-golfers!!! It’s not too late to sign-up….come join us for a fun day for a GREAT cause!!! Here are a few pics from last year….. The 6th Annual Eric Keeslar Golf Tournament is in Sonora, CA on Saturday, April 14th. This is a fund-raiser to raise money to support my brother, Eric. Eric continues to “fight the fight” every day and every dollar earned helps him with his spinal cord therapy. This Golf Tournament is a great opportunity to see Eric and his family, golf, participate in a silent auction, or just enjoy delicious BBQ and have some FUN!!! Looking forward to a great event!!!! Wow, what a fun weekend and a huge success for the 5th Annual Eric Keeslar Golf Tournament! THANK YOU to everyone who joined us last weekend and supported this event! We appreciate all the hard work the Norvell family put into making this tournament happen and to everyone who sponsored, donated, golfed, ate, showed up, sent well wishes and supported Eric…what a fantastic day!! We had friends and family join us from near and far, enjoyed a beautiful sunny day and had a great turn-out for the event. All the proceeds raised go directly towards Eric’s ongoing spinal cord rehabilitation. Personally, I feel very grateful for all the love and support everyone has given to Eric and I know that it makes a huge impact on his life financially and emotionally. Life is a journey and so many of you have shown that we’re in it together…looking forward to next year! We’re looking forward to the 5th Annual golf tournament this weekend!!! We have removed the registration for this event as we are capped on our anticipated number of golf participants. However, if you can come join us for the BBQ, we’d love to see you. You can still sign up for the BBQ on this site. Come join us for food, silent auction, raffle and a great time!! Come join us for the 5th Annual Eric Keeslar Golf Tournament! All Golfers and non-Golfers welcome!! Where: Phoenix Lake Golf Course, 21448 Paseo Del Los Portales Road, Sonora, CA. Participate in the 4-person scramble or just come for the BBQ dinner and silent auction! This is a Fundraiser for Eric’s Spinal Cord rehabilitation. 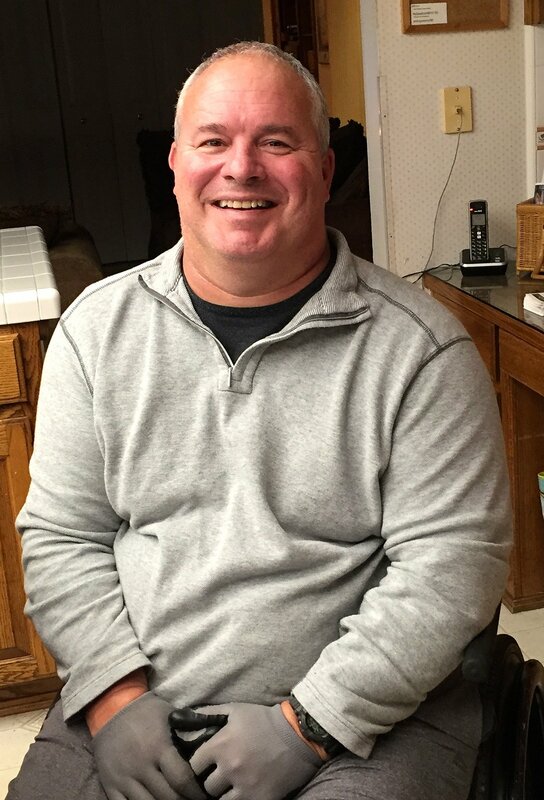 As you may know, Eric was in a car accident and suffered a spinal cord injury 4 ½ years ago. His therapy is an ongoing process and many of the treatments are not covered by health insurance. Donations are tax-deductible and all proceeds go directly to Eric’s therapy and medical costs. See attached flyer for address and details. Please message me if you have specific questions. It’s not too late….come join us this Saturday, April 16th for the 4th Annual Eric Keeslar Golf Tournament in Sonora, CA!!! If you are not a golfer, come on down for the BBQ, raffle and festivities! Tee-off is at 10am and the BBQ is at 3pm at the Phoenix Lake Golf Course—Let me know if you have any questions….We’re looking forward to this great event to support Eric! Calling all golfers and non-golfers!!! It’s that time again…join us for the 4th Annual Eric Keeslar Golf Tournament! The tournament will be Saturday, April 16th at the Phoenix Lake Golf Course. Please help support Eric’s rehabilitation costs. Looking forward to this event–Eric and the kids will be there, too…hope to see you there! Eric is doing well and continues to fight the fight every day!! We are all incredibly proud of him! The expenses associated with spinal cord rehabilitation are an ongoing challenge as you can probably imagine. However, Eric continues to work out at a local gym and focuses on equipment and physical therapy adjuncts that may help him get “his legs back”. We’re looking forward to the 4th Annual Eric Keeslar Golf Tournament on April 16th, 2016–check out the info below. We continue to appreciate all the support that Eric has received. Many blessings for a wonderful 2016. Come join us for the 3rd Annual Golf Tournament!!! The tournament will be May 2nd in Sonora, CA at the Phoenix Lake Golf Course. Even if you aren’t a golfer, join us for dinner…Eric would love to see you! See information for tournament and sponsorship below. September is Spinal Cord Injury awareness month and we need your help!!! How many of you will have a cup of coffee or a latte each morning this month? What if you gave up just one or two coffees a week for the month of September…then donated that money to support Eric’s spinal cord rehabilitation efforts? That would be nearly $20.00! Many of you know my brother Eric’s story….he was in a tragic accident 2 years ago and suffered a spinal cord injury that left him paralyzed. Today, he works hard every day to fight to walk again. And I’m sure you can imagine that it’s a long and financially challenging journey, but I believe that we can help him through this!!! It’s tough asking the people in your life for money (believe me, that’s why I’m a nurse and not a salesperson ☺)…but I believe in Eric and I believe in his cause! Donations are tax deductible and all of the money raised goes directly towards Eric’s physical therapy expenses. Please consider helping us spread the word…. forward, “boost post” (still not sure what that does on FB? ), share with a friend, e-mail, text or whatever you can think of to get the word out…..we’d love to keep Eric in therapy working towards this incredibly important goal of walking! If you have any questions, please contact me at: [email protected] or (208) 867-1727. THANK YOU to everyone who participated and supported the 2nd Annual Eric Keeslar Golf Benefit–what a great event!!! Destiny and Damon Norvell did an awesome job of coordinating all of the participants, donations, planning and keeping track of all the fine details–excellent job! We’re already looking forward to the “3rd annual”, so we’ll let you know as soon as we pick a date. We are excited to partner with HelpHOPELive to streamline fundraising efforts for Eric! In the coming months, we hope to have several fundraising events, so we’ll keep you posted as they develop. Eric, Hope to see you next year. Bert. Eric, Its always my pleasure to come out and golf on "your" day! Its mine and my wife's favorite tournament. It was great to see you and all that love for you. Great speech Buddy! Keep up the great work, Kees, you're an inspiration to all of us, especially me! Love you, brother! Eric--you look great and what a great family! I admire you for your fight and I'll help if I can. Eric, we are so proud of you and of how hard you are working to get back what you've lost. Keep it up. We are here for you in any way we can. We love you. Keep up the good work Eric!! !